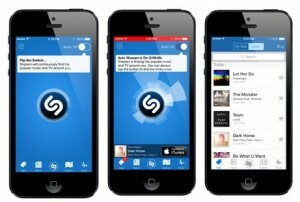 Shazam, the music identification app is coming to Apple iTunes via Siri – according to reports by Bloomberg. Anonymous sources from teh London startup hinted at the collaboration as a feature in the upcoming iOS 8 launch, expected on June 2 of this year during Apple’s annual developer conference. Since adding NPR radio streaming to iTunes, Apple has been focusing on enhancing the music streaming feature in a crowd of music apps. With competitors like Spotify, Rdio, and Pandora, a Siri-assisted Shazam feature may not be all that it takes. Last year was the first year where iTunes downloads fell since the digital music store’s inception.